Sunseeker’s new Hawk 38 flies through its first sea trial. Following its highly anticipated launch earlier this month, Sunseeker has put to the test its brand-new high-performance day boat – the Hawk 38. 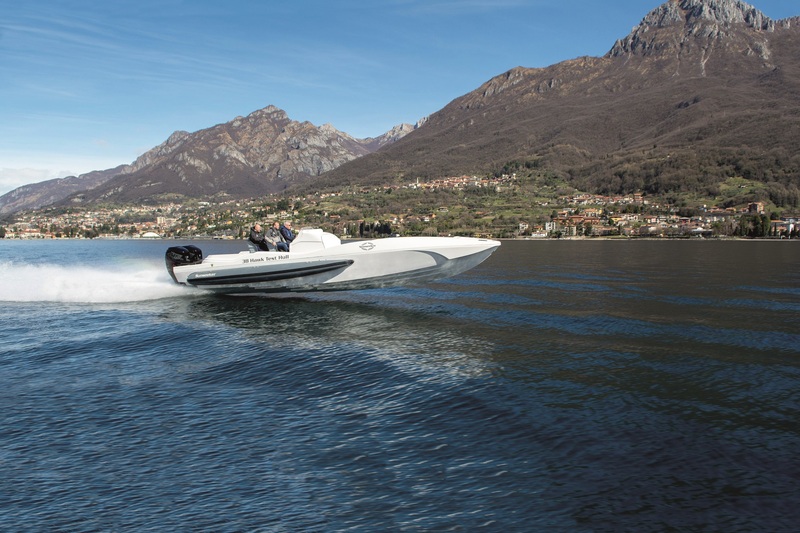 Exhaustive prototype sea trials have now taken place on the waters of Lake Como in Italy and will now continue back in the UK. With initial performance and handling critical to the sea trial, Sunseeker was thrilled to report that its first prototype hull, and with the legendary Fabio Buzzi at the helm, achieved an incredible top speed of 68.7 knots. Estimates for the finished boat with console, carbon fibre roof, deck mouldings and fittings remain 62–63 knots; exactly as calculated. Noticeably, the incredibly low noise and vibration levels are groundbreaking, even at maximum speed thanks to the all-new patented structural-foam hull technology. 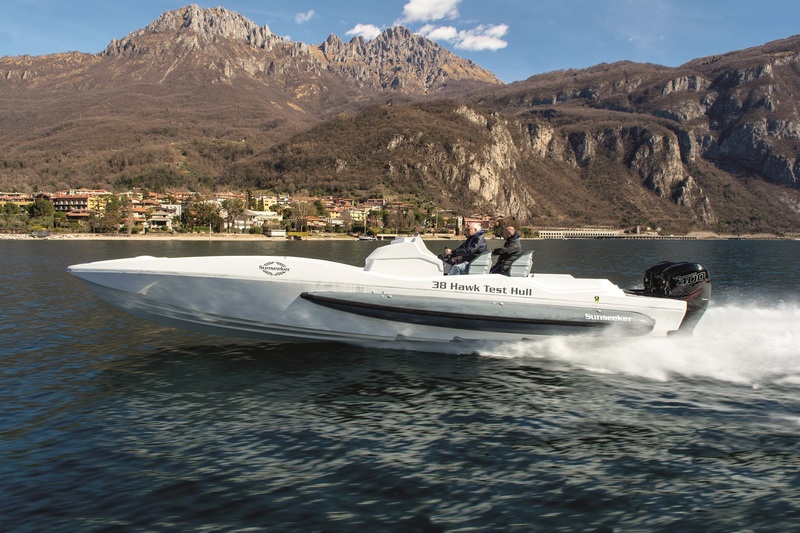 Combined with the inflatable Hypalon 866 STAB tubes and Mercury 400R engines, the boat is delivering the dynamic performance it was designed for matched with exceptional turn-in and grip. 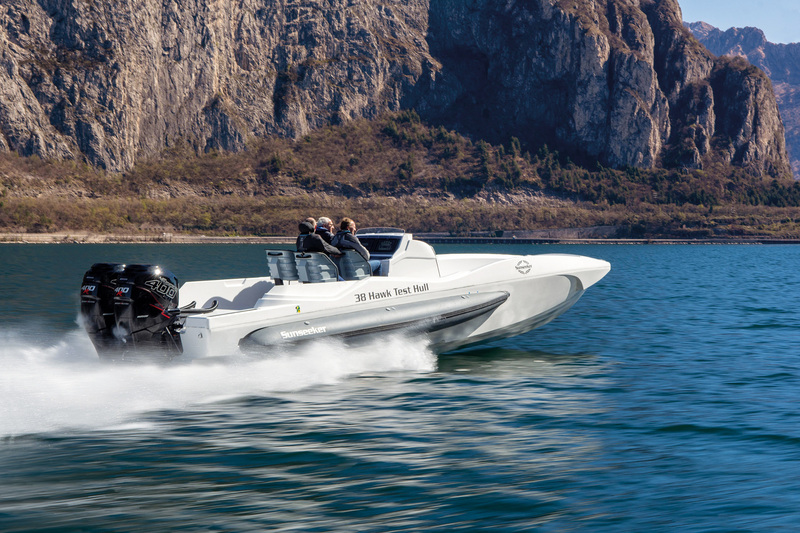 With a smooth running hull and the addition of four Besenzoni racing seats with shock absorbing mitigation, occupants can either sit or stand for optimal comfort and safety; thereby allowing owners to fully explore the limits of this boat’s performance.